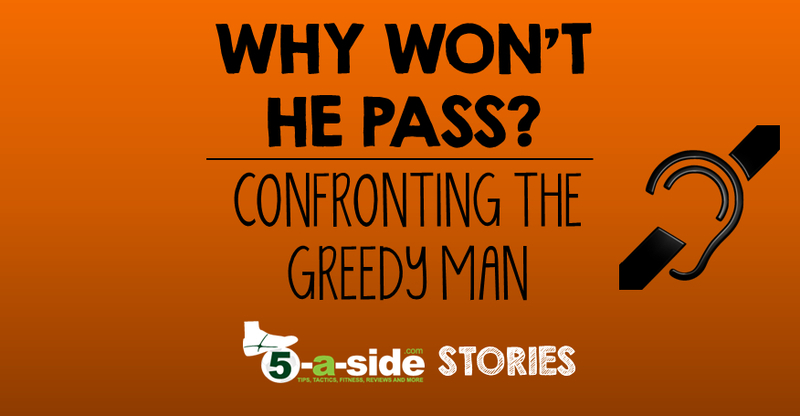 Story: Why Won’t He Pass? We play 5-a-side regularly and most of the time we have the same players, but every now and then, either through injuries or other commitments, we need replacements. One time we had a new guy come in and play. He was late 20’s, left footed and seemed decent standard, so all looked good. Anyway, weeks went on and we noticed this guy never passed if you were on his right hand side, the ball always went left or he lost it. We put it down to the fact he was new. We are quite a mellowed, easy going lot but this was starting to get to us all. This carried on and on, and by now we were all getting pissed off at it happening every week. So it was agreed that if it continued someone would have to tell him to stop being a greedy b*llocks and pass or we would need to get someone else. One week after it had happened again, we all agreed we would confront him and see what his problem was as we had all had enough. So everyone was pumped and ready for confrontation when he declared he was deaf in one ear!!!! Never have I seen a team of grown men be so humble, then we all burst out laughing. He couldn’t believe we didn’t know! We had to explain that we just thought he was a greedy b******. The worst part is that apparently he told one of the guys about this already, but he was that was injured and he didn’t pass it on!!! Thanks for that. Turned out to be one of my funniest moments at 5-a-side!! Thanks again to Rosco (who also brought us “Brolly to the Throttle” for submitting this one. If you’re reading this and have got a tale to share with us, get your submission to us on the stories page now.